The 2nd National Post Doc Symposium was held at CSIR - Centre for Cellular& Molecular Biology (CCMB), Hyderabad, from 3 - 5 October, 2018, and was organized by postdocs from CCMB, National Centre for Biological Sciences (NCBS), and Institute for Stem Cell Biology and Regenerative Medicine (inStem) with funding support from IndiaBioscience and the Wellcome Trust/DBT India Alliance. 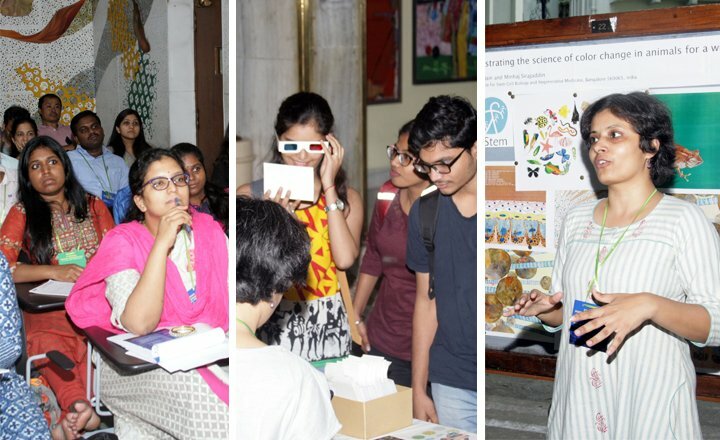 The event was attended by 70 postdocs from across India, representing 37 different institutions and uniting with the singular focus of taking their community forward. The theme for this year’s symposium – “Mentoring Matters” – underscored the conversations at the meeting. Mentoring during the workshop was not limited to the scientific work of postdocs, but extended to career decisions and hands-on workshops to improve soft skills. Rakesh Mishra, Director, CCMB, defined the agenda by noting that while the growing postdoc population in India is a sign of maturation of the scientific system, further support from the wider scientific community is required to nurture its development. The Symposium has historically been postdoc-centric with dedicated sessions for postdocs to present their work. 18 postdocs from 13 institutions gave short chalkboard or oral talks about their science, and received on-the-spot feedback from mentors attending the same. In addition, poster sessions allowed the postdocs to have insightful conversations with invited faculty mentors. During the course of the meeting, established scientists including Mukund Thattai (NCBS), Rashna Bhandari (Centre for DNA Fingerprinting and Diagnostics (CDFD)), Jyotsna Dhawan (CCMB), LS Shashidhara (Indian Institute of Science Education and Research (IISER), Pune) and Roop Mallik (Tata Institute of Fundamental Research (TIFR)) shared their personal scientific journeys that may inspire many of the participants in their own quest for academic success. A key message from these talks was that flexibility in trying new scientific questions or risking an untried path can facilitate career development. SC Lakhotia (Banaras Hindu University (BHU)) and Appa Rao Podile (Vice Chancellor, University of Hyderabad) called for postdocs to assess the immense value they can bring by teaching in academic universities. They pointed out the responsibility that the postdocs would be able to discharge in shaping the minds of the future scientists of India. There was also a strong industry representation in this year’s symposium with talks by Vijay Chandru (Strand LifeSciences), Radha Rangarajan (Vitas Pharma) and Krishna Ella (Bharat Biotech). Industry R&D has many opportunities for postdoctoral fellows – not only in the laboratory, but also in other areas such as science advocacy and business development. Madhankumar Anandhakrishnan (Wellcome Trust/DBT India Alliance) conducted a grants writing workshop, offering useful pointers on putting together strong grant applications, with a focus on the India Alliance Early Career Fellowships. Sarah Iqbal, also from the Wellcome Trust/DBT India Alliance, summarized the need to humanize science for public communication and explained the power of authoritative science communication. Sarah echoed a need for India’s scientists to engage constructively with the society to explain their scientific pursuits. In addition to mentoring and networking, the postdoc symposium is meant to be a platform for postdocs to raise and address their concerns. Rashna Bhandari moderated a panel discussion with Dhawan, Thattai, Lakhotia, Mallik and Shashidhara on the issues faced by postdoctoral fellows, including the need for more postdocs in India, reforms in fellowship structures, and the quantum of salary currently being offered. The general consensus was that an effective postdoctoral fellowship should be awarded for a minimum of three years with the provision of extending by an additional two years, subject to a transparent review. A more pressing need is to review the salary of the postdoctoral fellows across the country and to install a mechanism to ensure timely dispensation of the salary. It was recommended that salaries for Research Associates need to be significantly higher than present guidelines for emoluments laid down by the Department of Science and Technology. One suggestion was to follow the pattern in western countries, where postdoc salaries are 2-2.5 times the fellowship offered to graduate students. A higher band to felicitate exceptional performance could be created to competitively encourage postdocs. There was also a call for a transparent review process for faculty recruitment as there is a profound perception that Indian institutions prefer postdocs who have trained overseas over India-trained fellows. These perceptions where backed by data presented from a survey of over 600 Indian BSc/MSc/PhD students conducted by Megha (PostDoctoral Fellow, NCBS) and Shambhavi Naik (Research Fellow, Takshashila Institution). 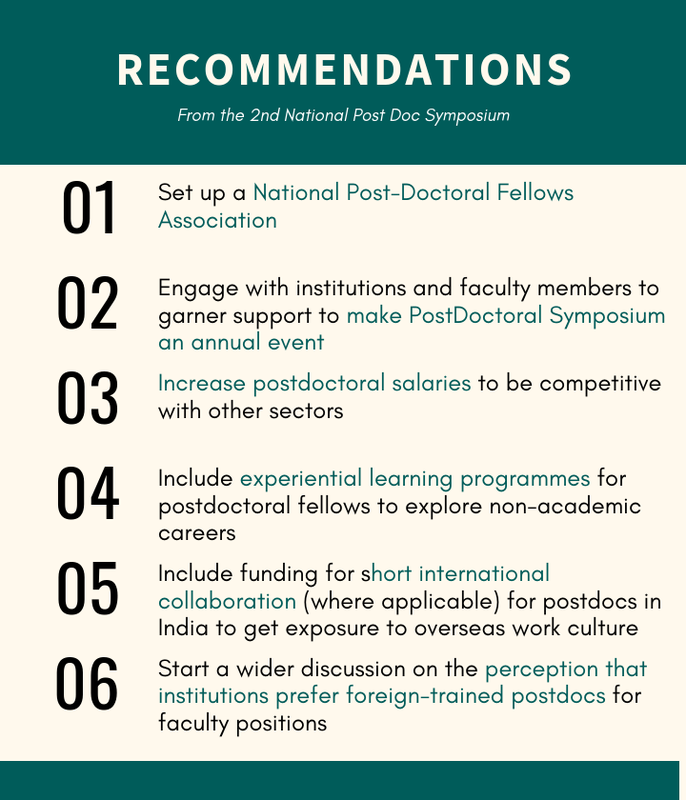 Consequently, inclusion of a short international collaboration component in fellowships would better equip the Indian postdocs with the training and exposure that make foreign trained postdocs desirable. Further, formal mentoring to guide PhD students and postdoctoral fellows on career choices and increased engagement between research institutions and universities was deemed necessary for the growth of the Indian scientific community. During the second day, Jay Shankar from Empowered Learning Systems, Pune, conducted a two-hour workshop on presenting your best self. This was an interactive session that let the postdoctoral fellows explore their own communication skills in an informal setting. During the workshop, the participants put themselves in unfamiliar situations and ended up introspecting about their persuasion skills, honing interactive capabilities and creating some long-lasting friendships. Day 3 was conducted at the Atal Incubation Centre-CCMB and was focused on non-academic careers with the opening talk by Smita Jain (IndiaBioscience) who gave an overview of the various choices a PhD in life science opens up. The day covered a spectrum of non-academic career options for postdocs – Sahana Ghosh (Mongabay India) outlined the path to journalistic science writing, Shyam Suryanarayana (SciTal) suggested frameworks for self-identifying areas of strength and improvement and Jayashree Ramadas (Tata Institute of Fundamental Research, Hyderabad) gave insights about science education. A panel discussion on careers highlighted a key area of improvement – most postdocs understood these career options exist but did not know how to pursue them. Short internships for postdocs to explore these opportunities would encourage them to make the best use their skills in areas other than the laboratory. Other talks included Vishwanad Bhoomi and Uma Parameswaran, who spoke about their work profile and job opportunities in the healthcare company, Novartis and patent research services company, SciTech, respectively. The event concluded with a panel on entrepreneurship led by S. Ramaswamy (InStem) with a short question and answer session for postdocs to quiz startup founders, investors and mentors. The event organisers (Prabhavathy Devan and Gunjan Purohit, CCMB, and Dhananjay Chaturvedi and Sanchari Banerjee, NCBS-InStem) gave an overview of the journey of the symposium and there was a widespread agreement that this event needs to be held annually. This event is run voluntarily by postdocs but requires the support of institutional faculty and management. The organisers expressed their heartfelt thanks to Jyotsna Dhawan for her efforts in bringing this event to fruition at CCMB. A special thanks was also expressed to the various agencies that provided funding and logistics support – IndiaBioscience, Wellcome Trust/DBT India Alliance, and the Atal Incubation Centre-CCMB. Funding was also provided by industry partners (Bharat Biotech and Editage-Cactus Communications) to sponsor dinner engagements, creating an ideal atmosphere for the postdocs to mingle with each other and with mentors. The many conversations that have arisen from this symposium need to be further refined and reiterated to effect changes. Postdocs are a vital part of the Indian scientific community and only with the support of the entire community can this substantive cohort continue to flourish. Through this self-created platform, the postdoctoral community is seeking the attention and support of scientists, students and policymakers to help them drive Indian science.